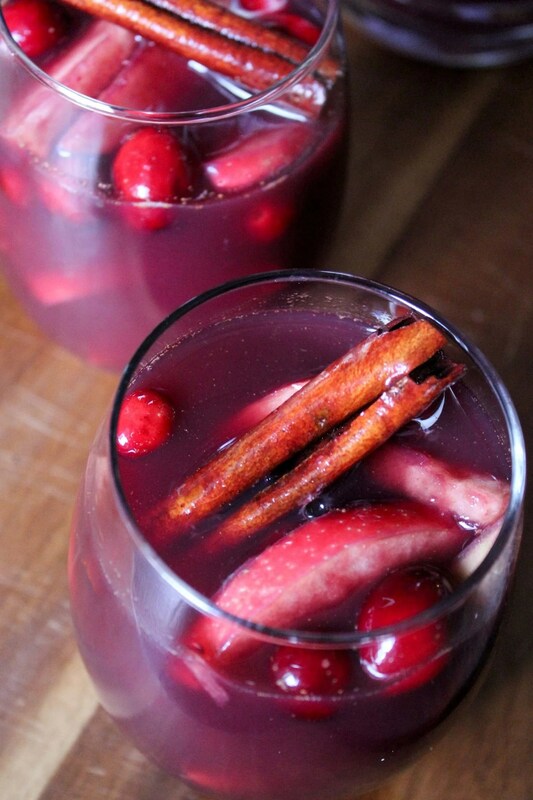 Cranberry apple sangria is the best sangria for Thanksgiving! It’s made with honeycrisp apples, apple juice, red wine and cranberry juice. 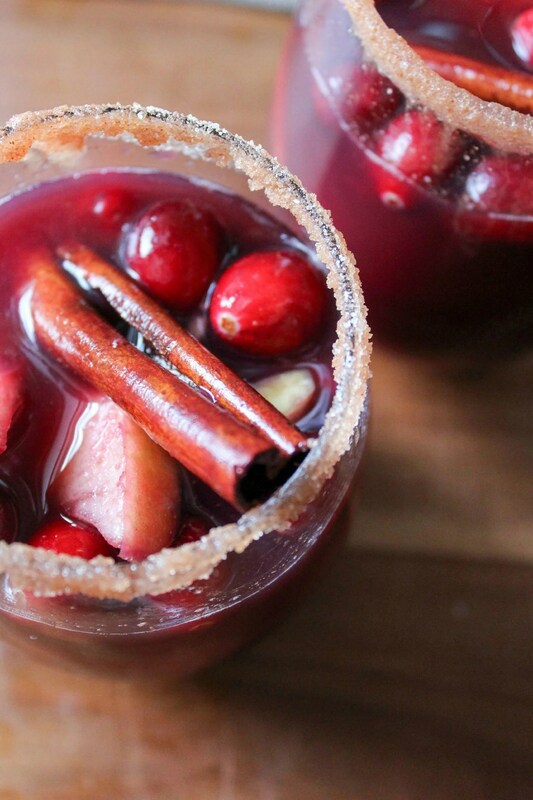 It’s rimmed with cinnamon-sugar and it’s such a festive holiday drink! Why is it that the short work weeks always seem the longest? You try to cram one workweek into three days and you end up at the office until 7pm. That’s exactly what happened to me this week. 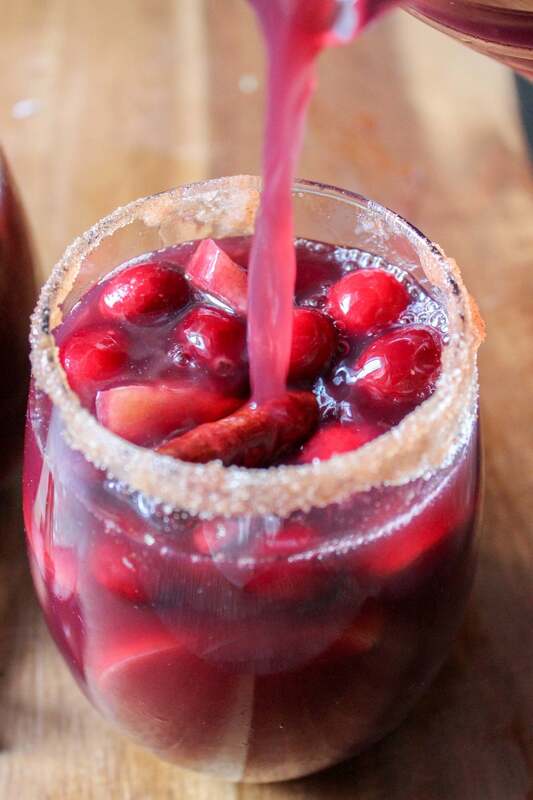 And the only thing I’m craving when I get home, kick off my shoes and put on sweats is a big giant glass of this Cranberry Apple Sangria and a bowl of cheddar popcorn – Olivia Pope style. I purposefully made extra for my Friendsgiving over the weekend so I would have more for the week. But it will be gone before Thursday, so guess I have to make more for real Thanksgiving. It’s an endless cycle of delicious. I’m a firm believer in sangria. Which is why I’ve already made Apple Cider Sangria and Raspberry Moscato Sangria. It’s always a crowd pleaser. And by crowd I mean me. But seriously, everyone loves it. So I obviously had to come up with a concoction I could serve for Thanksgiving and Christmas. It’s so easy to down this drink because it tastes that good. But it also looks so pretty! I almost (almost!) didn’t want to drink it. The dark reddish purple color is so appealing, especially when you rim the glass with cinnamon sugar and garnish with a cinnamon stick. You will impress everyone at your holiday gathering! It’s the perfect cocktail for the chilly weekends and holiday festivities ahead. 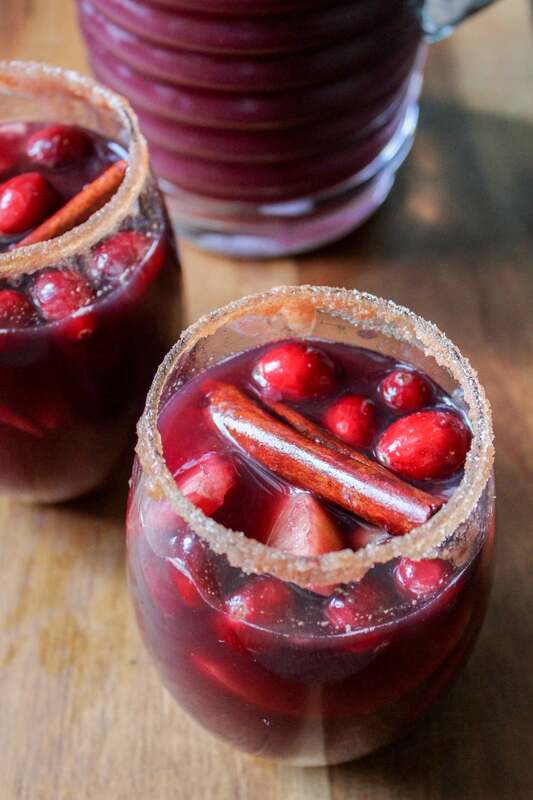 Each glass is bursting with fall flavors like cranberry, citrus, apple and cinnamon and it’s so easy to make ahead of time! Actually it’s better to make it the day before. You look so prepared and the recipe tastes better. All of the delicious wine and juice flavors have time to get veryyy merry in the fridge with the fruit. The fruit infuses with all the flavors and becomes so flavorful. Drunken Honeycrisp Apples. Does not get better, people. What’s the best wine to use for apple cider sangria? If you’re not a wine connoisseur, no problem. My suggestion is to just choose your favorite red wine. I’m a huge fan of red blends so that’s what I went with. It’s not that fancy schmancy and easy to drink. Not to mention there is typically always a red blend section in the grocery store so it’s so easy to find. Before you serve this tasty drink, make sure to add the club soda right before serving. It gives the drink a pop of bubbly brightness. Grab these ingredients and pour yourself a cup full of holiday cheer. 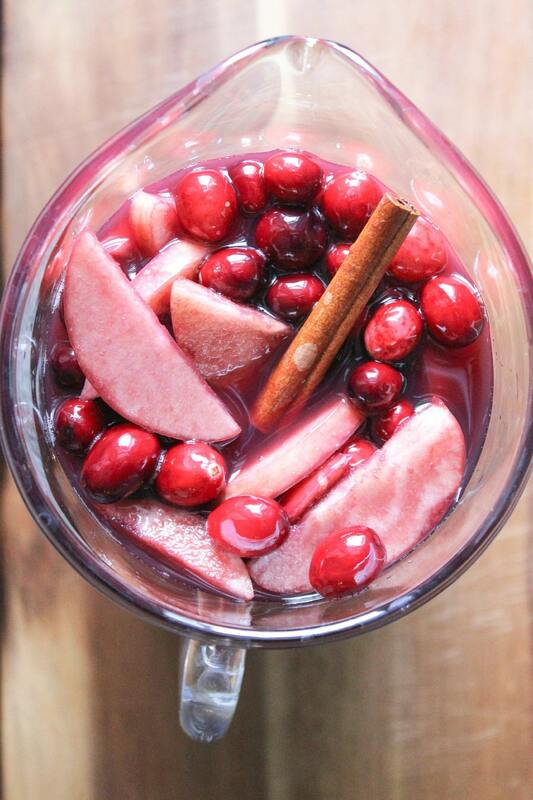 Add the cinnamon sticks, apples, oranges and cranberries to a large pitcher. Add the wine, apple cider, cranberry juice, bourbon and lemon juice. Place in the refrigerator for 8-24 hours. Add a splash of club soda to taste right before serving. For a cinnamon sugar rim: dip the rim of the glass into the sangria and dip into a full filled with sugar and cinnamon. Pour the sangria in the glass and garnish with a cinnamon stick. Can I use apple juice instead of apple cider? Hi Dani! Absolutely, apple juice will work perfect as well. Thanks! Thanks so much! I’m excited to try this! did you use lemon or lime juice? the ingredients same lemon- the directions say lime. Hi Kim! Sorry about that, typo!. I used lemon juice here, but lime juice actually works well too. I’ve tried both ways:) So either one you have on hand is great.